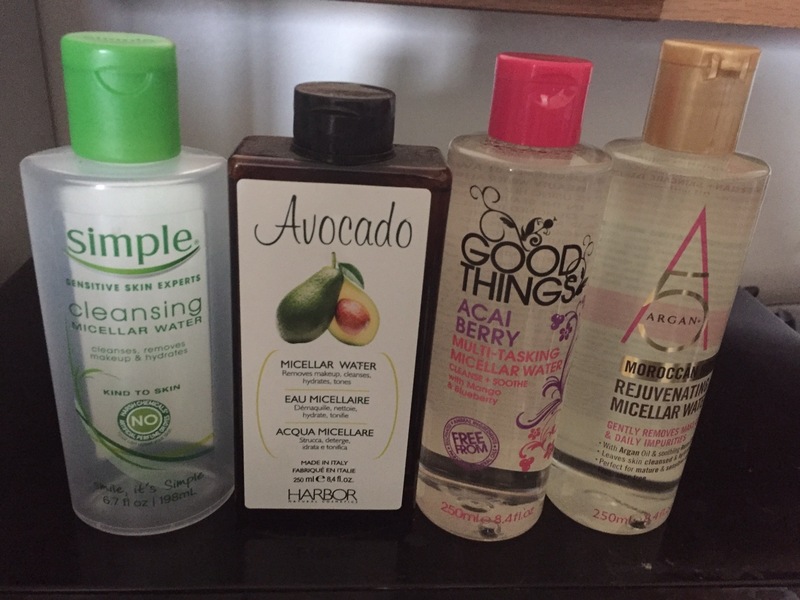 Sorry it’s a bit delayed, but this week’s Friday favorite of mine is micellar water! When I first heard about micellar water, the only brand that was relatively known was the Bioderma version. At that time, I was like there’s no way I’m spending upwards of $20+ on a bottle of “water” to clean my face. Alas, Simple and other brands like Garnier, etc started coming out with their own version at a much more reasonable price point. So, I picked up the Simple version and figured I’d see what all the hype was about. Now I’m never going back. Even after cleansing, micellar waters somehow manage to get even more makeup and residue off my face! I’ll usually use them while double cleansing to ensure my face is squeaky clean before a sheet mask. They’re also great if you’re feeling lazy as no rinsing is required. I keep one next to my bed with some cotton balls. So far, I’ve tried a few varieties and all seem to do their job. My favorite thus far is the Simple brand, but I am itching to try the new Garnier version that is out in drugstores now as well as some of the K-beauty versions out there. Simple has also come out with micellar water wipes which I’m very curious about. Some of the others I’ve tried/purchased include those in the picture and all were purchased from T.J. Maxx and/or Marshalls for around $3.99-5.99. Good Things Acai Berry Micellar water- has a faint berry smell. Haven’t tried this one yet so I’ll update in the future once I’ve tried. Argan Moroccan Rose Micellar Water- another one I haven’t tried yet, has a faint smell of rose. I’ll be linking the ones I’ve tried down below that can be found as well as some of the others I’m dying to try! The Boston Bargainista is a participant in the Amazon Services LLC Associates Program, an affiliate advertising program designed to provide a means for sites to earn advertising fees by advertising and linking to Amazon.com. Other affiliate links are also present in this post. Etude House Real Art Cleansing Water from Memebox. Innisfree Green Tea Cleansing Water from Memebox. Use http://share.memebox.com/x/KG2Q6u for 20% off your 1st order of $25+.